Too much time in shopping malls and I get kinda spacey – a weird loopy ‘get me the hell outta here!’ phenomenon. My partner shares my tolerance level so we when we’ve hit our ‘limit’ – no questions asked, it is an immediate exit stage left right out the door of whatever massive shopping complex we find ourselves. We also do NOT step into a mall without a very clear purpose and focus. So when planning a quick trip to Bangkok, folks I hoped to catch up with BOTH proposed meeting at Bangkok’s Terminal 21 – I started to glaze over even before leaving India! Worse still, there would be a couple of hours – HOURS – gap between meetings. Aaaakh!! The thing is, for me shopping is a bit like speed dating – especially for clothes. I’ll know first glance if the store is worth the trouble. Then a whirl of grabbing possibilities, quick pit stop for rapid change and I’ll march to the counter, card or cash clutched in hand. This is made even more extreme in India as some stores make me mortified to find XL too tight and then even more confused when XS from another store fits?! Years ago in Hong Kong, a friend and I planned to explore Kowloon for a day. While it seemed warm in Wan Chai – the ferry ride alone was a clear sign a light t-shirt was not sufficient! The Christmas decorations should have been a clue to bring along something a bit warmer…. especially as I’ve fully adapted to Indian style shivering at 20’c. As I forgot to bring along my handy shawl, it was a great case of priority shopping for something warmer! So we popped into a factory discount store and minutes later my hapless companion quipped: “A guy could get whiplash shopping with you!” We were definitely incompatible as shopping cohorts and this wasn’t even a mall! Over the years, I’ve become more than a bit jaded by mega malls having experienced West Edmonton Mall back when it was the world’s largest mall, Mall of America during a lay-over in Minneapolis, downtown Manila is practically one giant mall, Hong Kong, Shanghai, Beijing, Dubai… they all blur… Meandering without purpose for several hours in these massive structures with the same or similar types of stores is NOT my idea of fun. Even if it is playfully aping at being an airport – especially after having just being in both Bombay & Bangkok airports. After getting up early to catch my flight, landing to dash to the airport link, two sky trains, cab, quick check-in at the hotel, jog to the MRT, another transfer and somehow managing to make my 1st meeting only 10 minutes late…. What did your intrepid traveller do to while away the hours til the next meeting?? Hide out in a movie theatre cowering away from all those scary stores!! Anyone else find too much time in mega malls a frightful proposition?? By Carissa Hickling in Thailand, Travel, Work on July 6, 2013 . That’s the reason a lot of people are shopping online. There’s no hustle and bustle, and most of all no traffic.Your merchandise delivered to your home. Doesn’t always work tho – especially clothes and utterly inconsistent sizes! Agree with the sentiment. We came back from Europe via Dubai in January and, due to my youngest son having a broken leg he acquired in Ireland, the megamalls were one of the few viable options for our short stay there. 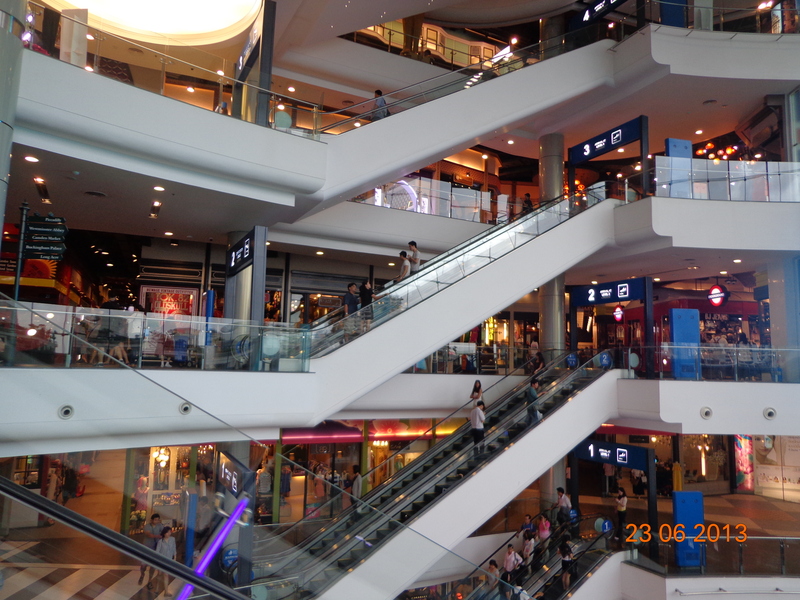 Once you get over the jaw dropping enormity of the malls in Dubai, the experience is frightfully uniform and sterile with the same chains and brands selling the same stuff. I could have been anywhere in the world. The one thing I did enjoy, though, was the amazing diversity of people wandering through the Dubai Mall food court! . Thanks. Yes my son is up and about – broken legs are a bother (especially when travelling) but in the end they heal and life goes on pretty much as usual! Go to the movies, or check out the local version of the food court! I don’t fit into most clothes in Asia so I have expanded my tolerances, especially when the weather is hot! Smart! Online shopping is still quite nascent in India. We did find one site that worked great for my partner but didn’t really suit me. It is developing and certainly a much more convenient option than being stuck in traffic for an hour or so, paying for parking and waiting another 20 mins just to exit, etc.